Scoliosis treatment in Shah Alam is better at the Chiropractic Specialty Center® located in Kota Kemuning. Our center combines the efforts of expert clinical physiotherapists and research-based chiropractors in treatments of the scoliotic spine. Before we began our discussion of scoliosis treatment, let’s go over some of the basic information concerning scoliosis and spinal curvatures. The spine gives our body its structure, allowing us to stand upright with the flexibility to bend and rotate. While most people with scoliosis have a mild form of the disorder; for example, mild spine, mild thoracic scoliosis, severe cases can significantly affect the quality of life by limiting or altering daily activity, causing pain, reducing lung function, or affecting heart function. Most cases of scoliosis are idiopathic, meaning the cause is unknown. Other causes of scoliosis are due to congenital or neuromuscular diseases. 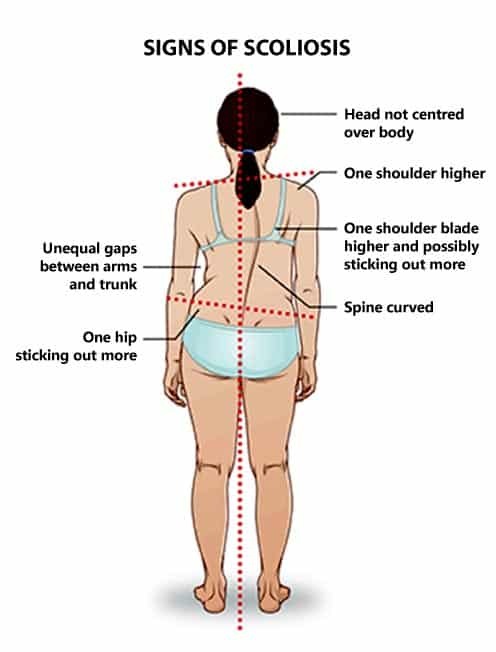 Although scoliosis can begin at any age, it most often develops in adolescents between ages 10 and 15, girls more commonly than boys. Other than physical abnormality, scoliosis is generally non-painful. Children can be screened at any age although Scoliosis Research Society recommends that girls be screened twice, at 10 and 12 years of age, and boys once at 12 or 13 years of age. It is important to stop the progression of scoliosis as it may significantly worsen during the child’s growth spurt at the start of adolescence (~10 years). Contrary to the common belief, scoliosis is a lifelong condition. In other words, if it is not managed well it can continue to grow even when your child becomes an adult where the condition is termed “adult scoliosis.” Therefore, the best thing to do is to get targeted therapy systems that manage and stabilizes condition to prevent worsening and limit progression. Our clinical teams of Chiropractors and physiotherapists offers the best scoliosis treatment in Shah Alam. Early detection and close monitoring are the keys to successful management of scoliosis in children. Adult Idiopathic Scoliosis – continuation or progression of adolescent idiopathic scoliosis into adulthood. In some cases, it is not diagnosed until adulthood. Adult Degenerative Scoliosis – typically occurs in the lumbar (low back) region due to degeneration of the disc or joints in the spine and arthritis. If the degeneration happens asymmetrically (more than one side than the other), it can eventually lead to curvature of the spine. At Chiropractic Specialty Center® in Shah Alam, the diagnosis of scoliosis begins with a health history. Our experienced chiropractor or physiotherapist will examine your spine and perform a neurological screening examination of the extremities testing strength, sensation, and reflexes. The patient is asked to perform Adam’s test and bend forward to observe for any rib or torso asymmetry. The irregular contour of the spine, unlevel shoulders and scapular protrusion are noted during this test. A scoliometer is used to obtain the degree of the rib hump. An angle greater than 5 degrees is an indication for an x-ray examination. X-rays show the extent and degree of the curve and determine the skeletal age and maturity. X-rays are also used to monitor the progress of the scoliotic curve for treatment planning. The scoliotic curve can be classified according to its size in degrees. Risk of progression depends on the age of the patient and size of the curve. Chiropractic Specialty Centers® offers a wide range of therapies and treatments for scoliosis. Our physiotherapists work on the muscles and ligaments of the vertebral column to promote flexibility and strength. Specific exercises and stretches may include the use of balance exercises and Spinercise®, a spinal rehabilitation system, found only at a Chiropractic Specialty Center® near you. Our chiropractor may perform gentle adjustments to improve mobility. The goal of our scoliosis treatment is to improve flexibility, strength, and balance to minimize curve progression. So, visit us today and discover therapeutic possibilities that others do not offer. Scoliosis treatment at a Chiropractic Specialty Centers® has the added benefit: we treat you with advanced technology that others do not have in Shah-Alam. The technology specific for the spine is the RxDecom®, a spinal decompression machine, the only one like it in the world. The RxDecom® works by decompressing stiff joints and pinched nerves in your back and neck, which is especially beneficial for degenerative scoliosis patients. The exercise-based treatment rendered at our center has reversed 30-degree curves by 5-10 degrees. The team of experts of chiropractors and physiotherapists at Chiropractic Specialty Center® will help bring your body back into proper function and minimize the detrimental effects of scoliosis. Early identification and treatment may help avoid the need for bracing and surgery. Chiropractic Specialty Center® provides only the highest level of treatment designed specifically for you. Our approach combines advanced and up-to-date physiotherapy, chiropractic, rehabilitation care and prevention to help you regain your life and stay healthy. Our team of chiropractors and physiotherapists strive to develop our skills and knowledge with continuous research and training. That is why we are the chosen specialist in spinal, joint, sports injuries and scoliosis treatment in Shah Alam, Malaysia.